Is there anything better than a bowl of gelato in a hot Summer day? Yes, there is: gelato with a lovely brioche con il tuppo. I am Piedmontese and I live in Liguria, but my next door neighbors (and good friends) are from Sicily. Last week, when the first real heat hit the riviera, they went out, bought 2 pounds of fresh gelato from this to-die-for gelateria next door to us and started baking. Baking what? With gelato?! Well, “for” gelato, really. 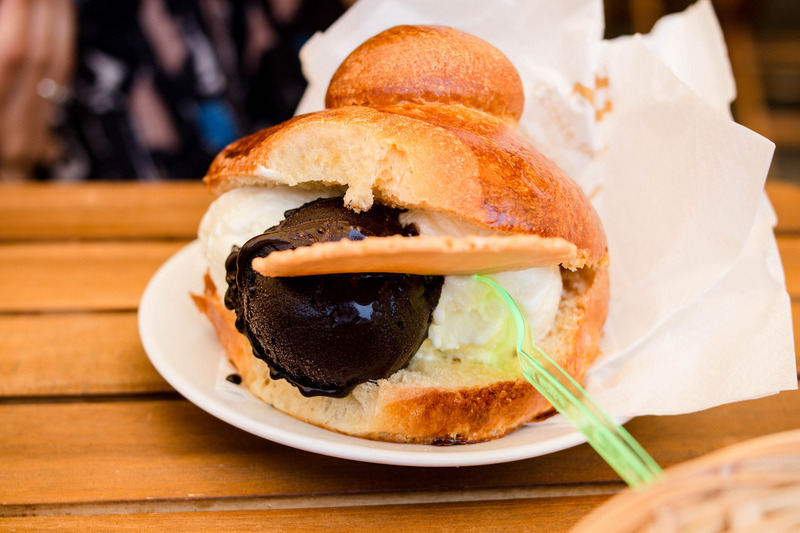 In Italy, in Sicily especially, we love eating ice cream as a filling for soft, sweet buns called brioche con il tuppo. You may be familiar with french pain brioche, which is however less dense and sweeter than delicacy we are going to show you how to make today. The brioche con il tuppo is like sweet bread: it has the same consistency, and the right level of sugary goodness to accompany the most delicious of gelato without making your deserved treat too sticky or heavy. This is a truly traditional Sicilian recipe, with ancient origins. Even its name is rooted in tradition, as it recalls the old-fashioned hairstyle women of the island used to wear: a bun, kept low on the nape of the neck, “il tuppo”, which look exactly like these brioches, made with two different sized balls of dough baked one upon the other. 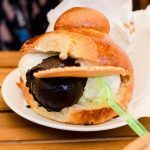 The brioche con il tuppo is delicious filled with gelato, but also dunked into an ice cold coffee or almond granita (the italian version of slushy! ), maybe topped with whipped cream. I had mine last week with a mix of pistachio, cherry, lemon and vanilla ice cream: cut the brioche in a half and just fill it with spoons over spoons of gelato! Seeve the flour and, in a large bowl or in an electric mixer, add it to the sugar, the salt and the yeast. If you use the fresh variety, mix it with the warm milk and wait for it to be activated (it usually takes about 10-20 minutes); if you opted for dry yeast, add the milk to these ingredients, along with the 6 eggs, one by one. Mix well, until the dough is smooth. Add the butter in pieces, one by one, and wait for each to be entirely incorporated before adding the other. This is a bit tedious, but the brioches are well worth the effort! Once the butter is all added in, transfer the dough in a bowl, cover it with cling film and let it rise for about three hours at room temperature. After that, transfer it to the fridge and leave it overnight. Once you take the dough out of the fridge work it straight away, while still very cold. Give it the shape and diameter of a baguette, long enough to be divided into 8 sections of about 150 grams each. Shape each piece into a smaller roll. Now, follow carefully because the next step is easy to make, but not simple to explain: take a single piece of the dough and roll it into an oval ball. With your fingers, press it at about 2/3 of its length to obtain the shape, so to speak, of a bowling pin, with a larger part, a neck (in the area you pressed) and a smaller, ball-like top. Make a hole with you fingers in the larger section of the dough piece and twist the smaller part into it: this seems hard, but the dough is elastic and it will not be a problem. By doing so, you will obtain a brioche that looks like two dough balls one on top of the other. Mix one egg yolk with two tablespoons of fresh cream, then brush the mixture on top of the brioches. Place them in the oven to rise for another 1 1/2 hour, making sure it is turned off, but with the light on. Once the last part of the rising is completed, you can finally bake the brioches con il tuppo in an already hot oven at 160 degrees celsius (320 fahrenheit) if it is a fan oven, or for 25-30 minutes, or at 180 degrees (355 Fahrenheit) for 35-40 minutes if it is static. Serve warm on their own or with a nice cappuccino or cold, filled with delicious gelato! The brioches should be consumed within 24 hours as they are best savored fresh. However, they can be frozen and kept for longer this way.